This map shows the Sourcegas transmission line alternatives proposed in Eagle. 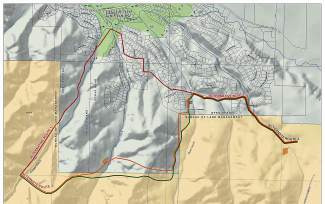 The route depicted in red is the existing pipeline location. What: Representatives from SourceGas, the U.S. Bureau of Land Management and the town of Eagle will host a information session about the Eagle Ranch natural gas transmission line project. Time: 4 to 7 p.m. with short presentations at 4:30 and 6 p.m. Details: Information will be available about the three alternatives currently being considered. Representatives from SourceGas, the BLM and the town of Eagle Open Space will be on hand to answer questions. EAGLE — Since 1994, a natural gas transmission line has been funneling the commodity right underneath a sizeable swath of the Eagle Ranch neighborhood. The line itself hasn’t undergone any changes, but the ground above it has undergone substantial ones. For that reason, Sourcegas needs to either upgrade the existing line or totally relocate it. That project is earmarked for construction in 2016 and will be presented to the public for the first time during an open house Monday in Eagle. According to Theresa Donnelly, SourceGas director of corporate communications, Monday’s meeting is intended to launch the community conversation about the transmission line. Because the alternative routes impact both U.S. Bureau of Land Management and town of Eagle Open Space, the two governmental entities are co-hosting the open house. The pipeline, called the Rifle-to-Avon Natural Gas Pipeline, serves natural gas customers in Garfield, Eagle, Pitkin and Summit counties. Donnelly noted that because of its proximity to residential and business areas, volume through the pipeline has been restricted and that is affecting the customers along the route. The 4.6-mile section of pipeline that currently crosses through the Eagle Ranch Subdivision needs to be upgraded to meet federal regulations or the entire pipeline route must be changed. Donnelly noted that Sourcegas, BLM and Eagle officials have been examining route alternatives for the past 15 months and have narrowed their ideas into three alternatives. The BLM will write an environmental assessment analyzing three alternatives proposed by SourceGas. Under one alternative, SourceGas would upgrade the existing pipeline segment in its current location through the Eagle Ranch Subdivision. Under the two other alternatives, SourceGas would re-route the pipeline south of the Eagle Ranch Subdivision area for about 3.4 miles through lands managed by the BLM and the town of Eagle Open Space. Additionally three 1-acre staging areas will also be evaluated at Hernage Creek Gulch, Third Gulch, and Hardscrabble Mountain Road. David Boyd, BLM public affairs specialist, noted the conversation about the pipeline project will not focus solely on these three alternatives. “We want the community to come out. We understand it is an important issue for the people in the area,” said Donnelly. The entities plan to identify the chosen route later this year in anticipation of construction in 2016. Donnelly said the work will begin in May and conclude by November. “We don’t want to surprise anyone in the community. Infrastructure projects can be inconvenient and they require patience and a lot of communication on both sides,” she said. Copies of the proposal and maps are available for review at the BLM Colorado River Valley Field Office and online at http://1.usa.gov/1Ipkjuw. The BLM hopes to identify any issues from the public before it begins writing the environmental assessment of the proposal. Written comments may be submitted at the public meeting, mailed to the Colorado River Valley Field Office, 2300 River Frontage Road, Silt, CO 81652, or submitted electronically to blm_co_si_mail@blm.gov. Comments should be submitted by Sept. 4.